The Samsung PS50Q7HD administers a serious body blow on the first meeting: the opulent exterior (complete with silver-edged ledge to hide a pair of built-in speakers) is absolutely knockout. And what's more, this 50-inch TV has promising specifications to back up this visual style statement, with a ridiculously high claimed contrast ratio of 10000:1. So far, so impressive. And the price is a steal for such a colossal HD-ready screen. But things take a dip when you cast your eyes over this plasma TV's sockets. A black mark goes into the margin when we note the single HDMI - not very helpful if you want to add an Xbox 360 as well as a Sky HD receiver. Here's hoping that twin HDMIs will be seen as an industry standard in the near future. Apart from lean HDMI pickings, the remainder of this set's connections are respectable enough, with two Scarts, component video jacks (for analogue high-def feeds), PC VGA input, and a common interface slot and digital audio output for the digital tuner. The digital tuner is supported by a seven-day electronic programme guide (EPG) - albeit one with limitations. For instance, the listings can only be scrolled through in two hour steps. The PS50Q7HD's feature count is healthier. On board there's DNIe picture processing (to improve colour tones, black levels and fine detailing), Smooth Motion Driver technology (to reduce judder), and the debut of FilterBright technology, which reduces ambient light reflections. That's a lot of picture processing for a small price. Cutting to the chase, we set about putting this 50-inch plasma through its paces with our standard-def test DVD of The Devil Wears Prada. Black levels are very impressive: deep and subtle, they're far superior to what we expected for the price. Colour tones are natural, if a tad over-saturated in places. Skin tones are also authentic. The good news continues with little sign of grain, pixel noise and colour banding: evidence that Samsung has overcome the usual gremlins that bait budget plasma screens. The pictures are really bright too, with little noise. Lovely. When given a hi-def feed of Planet Earth, this plasma really earns its stripes. We've seen slightly sharper hi-def efforts, but there is more detailing and texturing than we expected for the low price. Black levels are particularly superb, and when you couple this with the formidable colour palette on display, it's looking like that the PS50Q7HD is a real bargain. This Samsung's sonics don't impress us as much as its pictures do. The hidden speakers lack the frequency range and power to open up convincingly. Even the timid soundtrack of The Devil Wears Prada overwhelmed the poor mites, but we're thinking that somebody in the market to buy a whopping great plasma screen like this will probably have - or at least be investing in - a home cinema surround sound system. The audio deficiencies can't prevent us from recommending this sizable TV. 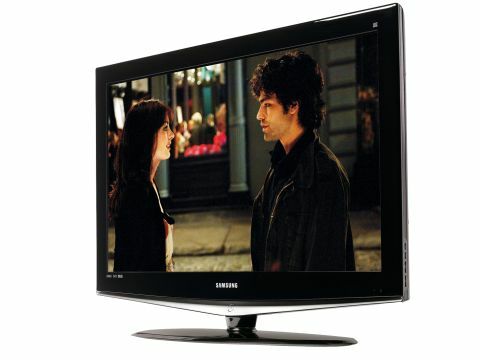 With great pictures when using both standard and hi-def material, more features than you can shake a good-sized stick at and a price that's easy on your plastic, Samsung has proved that plasma has plenty of life left.